The mountains that surround Bryson City, North Carolina provide some of the most spectacular in all of Western North Carolina. One of the most popular times to search out such viewing spots id during the fall, and that is why we have decided to fill you in on what us locals think are the top 5 best spots to take your family to enjoy the fall color! Wesser Fire Tower is a summit located in Macon County, NC near the community of Wesser. A wooden fire tower at the summit provides hikers with unimpeded views of the Great Smoky Mountains National Park and also the Nantahala Mountains. Hikers can park at Tellico gap then climb from Tellico Gap to the fire tower up a forest service access road (1 mile) or the Applachian Trail (1.4 miles). The summit is located at about 4500ft, and is within Nantahala National Forest. This may not be the highest peak in the area, but the 360 degree view is still amazing and the amount of people is minimal. The hike to the top is moderate in difficulty, the trail is well maintained but the elevation gain can be daunting, but the reward at the top is well worth it. 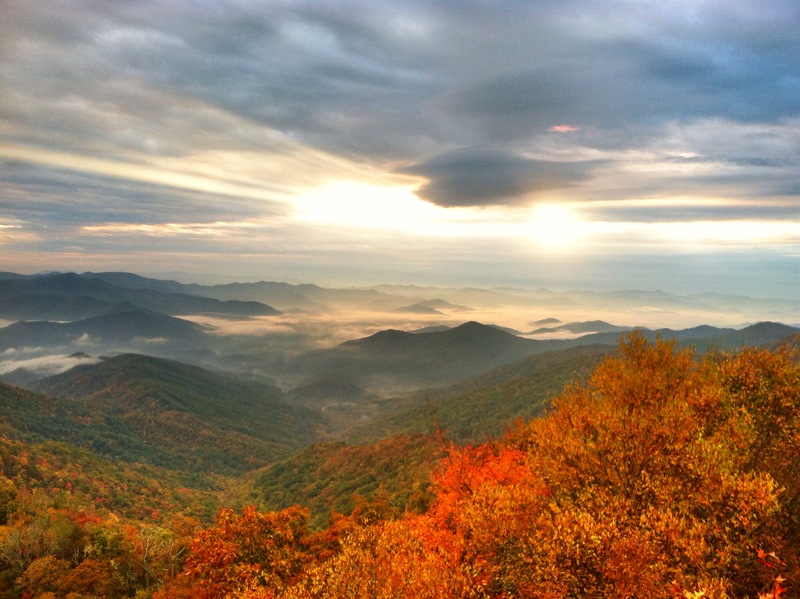 Wayah Bald is a high-altitude treeless open area in Nantahala National Forest, near Franklin, North Carolina. The Wayah Bald Observation Tower is located at the area’s highest point (5,385 feet). The Appalachian Trail and Bartram Trail cross at Wayah Bald. Wayah Bald is easily accessed by car and the hike from the parking area to the fire tower is short. In the fall be sure to encourage the Appalachian Trail hikers that are 4-5 days from completing their long journey a congratulations! Hooper Bald is a grassy bald mountain in the Unicoi Mountain Range located in the Cheoah Ranger District of the Nantahala National Forest in Graham County, NC. The summit is 5,429 ft and can be reached via the 0.5 mile Hooper Bald Trail. The parking area and trailhead is located between mile marker 7 and 8 along the North Carolina side of the Cherohala Skyway. We chose this lookout not only because the easy access and the great views, but because the drive to get to it is just as rewarding as the view from the top. The Cherohala Skyway is a great section of road that does not get as much traffic as the Blue Ridge Parkway, but is just as worthy. Black Balsam Knob is in the Pisgah National Forest southwest of Asheville, North Carolina, near milepost 420 on the Blue Ridge Parkway. It is the second highest mountain in the Great Balsam Mountains. The Great Balsams are within the Blue Ridge Mountains, which are part of the Appalachian Mountains. It is the 23rd highest of the 40 mountains in North Carolina over 6000 feet in elevation. Accessing this lookout is quite easy and the drive along the Blue Ridge Parkway from either direction is beautiful. Once you reach the parking area hike about .5 miles up along the grassy bald and enjoy a picnic lunch while taking in the views! 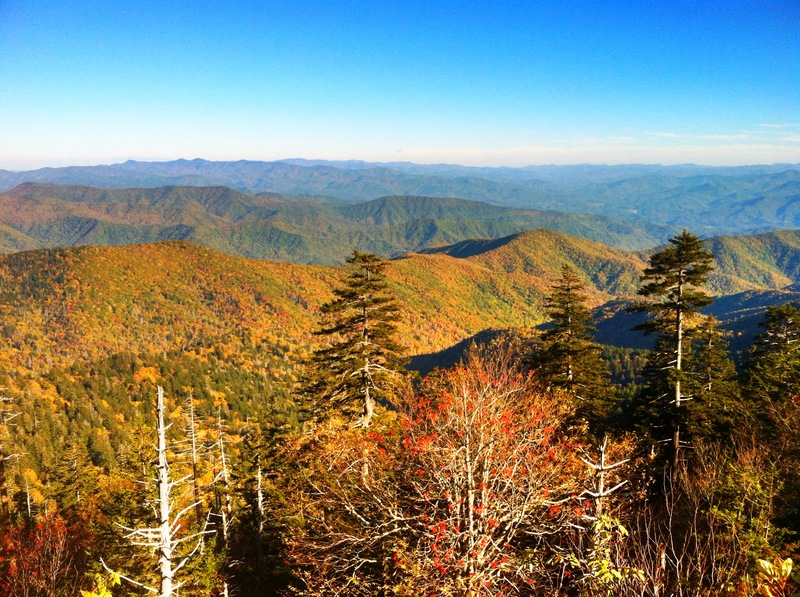 Clingman’s Dome is a mountain in the Great Smoky Mountains of Tennessee and North Carolina. At an elevation of 6,643 feet, it is the highest mountain in the Smokies, the highest point in the state of Tennessee, and the highest point along the 2,174-mile (3,499 km) Appalachian Trail. East of the Mississippi River, only Mount Mitchell (6,684) and Mount Craig (6,647 feet). This well known lookout is well deserving of all the talk, from the parking area the hike to the the lookout tower at the top of the mountain is straight up, but the trail is paved. The views from the lookout tower on a clear day cannot be matched, however, the amount of people that venture to this spot during the fall can be overwhelming for anyone looking to take in the beauty of nature in peace. Despite all of the people we still consider this spot the #1 lookout close to Bryson City, NC. All of these spots are great for their own reasons and we encourage you to try out each of these while you are in the area, because they all have different things to offer. Thanks for taking the time to read through this list and we hope we have inspired you to venture in to the mountains this fall season and catch some amazing views! BRYSON CITY, NC – This small town is not going to let the government spoil their fall season if they can help it. The town has launched a social and video campaign (#shutdownshutup) letting people know that there is way more to do in Bryson City than just hike the trails in the Great Smoky Mountains National Park and surrounding closed federal lands. Shut Down, Shut Up is now spreading across the internet and making its way in to the homes of thousands of potential visitors. I am currently sitting outside right at this moment enjoying the amazing fall air and watching the leaves fall all around, these mountains and this community are still an amazing place no matter what the government tries to do. It’s a Great Train Ride, Charlie Brown! Looking for some family fun while enjoying your Bryson City or Cherokee vacation cabin rental? Put on your costume and hop aboard the Great Smoky Mountains Railroad for the Peanuts Pumpkin Patch Express! Sit back and watch the scenery go by as you enjoy a narration of Charles Schultz’s “It’s the Great Pumpkin, Charlie Brown”. When the train arrives, passengers are greeted by Charlie Brown, Snoopy and Lucy and led to the activity area. Kids can enjoy trick-or-treating, roasting marshmallows, coloring, a bouncy house, live music and hayrides. Before leaving, each child gets to choose a pumpkin from the Great Pumpkin Patch! Great Smoky Mountains Railroad is located in downtown Bryson City. Click here for schedule and ticket information. Last weekend I had a chance to go to one of my favorite local trails, Wesser Creek near the Nantahala River. Being an avid photographer, I brought my camera and captured some of the brilliant colors and sunlight. This is one of the most vibrant leaf seasons I have seen in a while in Western North Carolina. If you get a chance to visit the area this time of year it is well worth getting out! 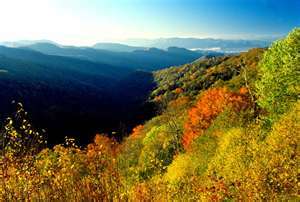 The fall leaf season is in full swing and the Smoky Mountains are awash with brilliant reds, oranges and yellows. 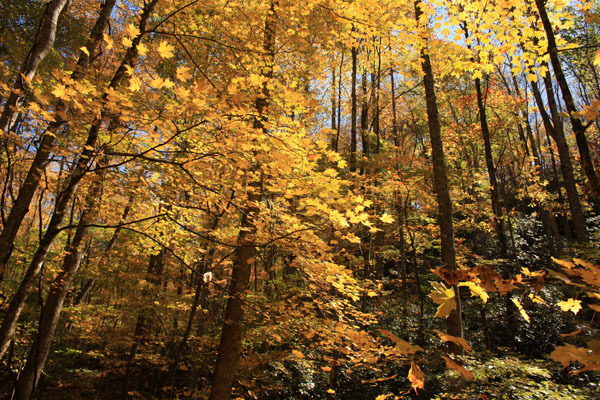 The reason we enjoy such a spectacular color season is that the Smokies have a remarkable variety of trees. Nearly 100 different species of trees including sugar maple, scarlet oak, sweetgum, hickory and birch contribute to our annual show. You can find brilliant autumn colors just about anywhere in the Smokies. There is no need to grumble your way along roads crowed with leaf-lookers! Chances are, you will have an amazing view of from the deck of your Bryson City or Cherokee vacation cabin rental! While the Blue Ridge Parkway is a popular destination that offers breathtaking long-range views, you may experience bumper-to-bumper traffic that can detract from the serene natural experience you were hoping to have. The most popular spot during this time of year is Cades Cove, which you may wish to avoid if you aren’t keen on the smell of muffler exhaust. One great option is to board the Great Smoky Mountains Railroad to view the fall foliage while enjoying a relaxing train ride. No need to pull over and get out your camera every five minutes; just park in downtown Bryson City, hop aboard and let someone else do the driving while you take all the photos you like! If you prefer to drive yourself, check out Cataloochee, on the eastern side of the Park. It is much less crowded because it’s away from the most traveled routes and is a little harder to reach from the Tennessee side of the park than Cades Cove. You will see the same spectacular colors and it is bound to be less crowded, even during peak color season. Most likely, you will even get to see some Elk! Directions: If you are coming from Bryson City or Cherokee, take I-40 to exit 20 and follow the signs 11 miles to Cataloochee. The trip from Cherokee is approximately 82 miles round-trip and can take several hours, depending on traffic and road conditions. Have fun!